Let's take back the example of our flowers. The Keying > Chroma Keyer has been already applied and the landscape background is visible behind the flowers. If you look at it in detail, you will see that some imperfections remain : a black borderline, more or less visible, is still remaining, small lines or points are not fully transparent and stand out from white clouds. The Alpha Control effect can fix these errors. * You can first notice the presence of a histogram, a tool you are now familiar with. This one represents the quantity of pixels displayed on screen depending on their luma (in percentage). The Shrink parameter can trim the opaque pixels of the image. 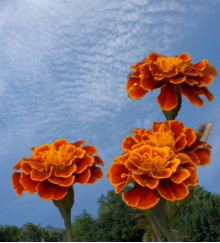 That is the best to remove the black borders around the flowers. The Erode parameter erase progressively the opaque pixels of the image by starting from its borders. It permits to soften the transition between transparent pixels and opaque ones, and even to improve the superimposition effect. Both Blur parameters can reduce and soften the shapes borders between opaque pixels and transparent ones. The Gain parameter permits to turn opaque and to darken pixels which are almost transparent. This is very useful to stand out the little imperfections, especially the ones that have not been fully removed when using some Keying effects. 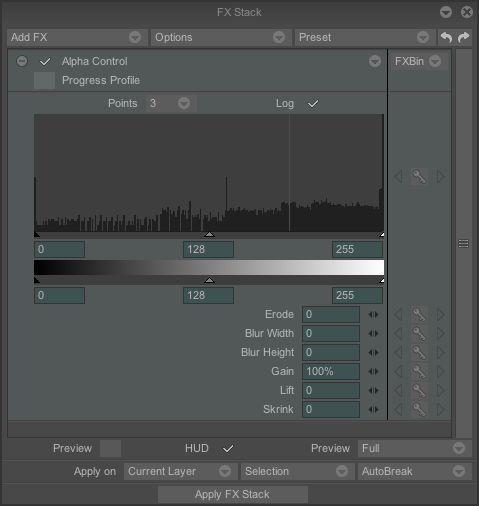 The Lift parameter lets you edit the alpha parameter of the mask.